The rate of job growth in the U.S. has been robust over the past several months as 2017 transitioned into 2018. Yet the expansion seen during February 2018 defeated expectations by a considerable margin. 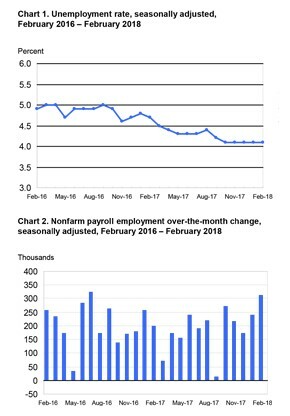 According to the latest edition of the Employment Situation Summary from the Bureau of Labor Statistics, nonfarm businesses in America’s private sector added 313,000 positions during the month. This figure was far ahead of estimates from a Bloomberg survey of prominent economists, who had predicted a gain of 205,000 jobs – strong, but still considerably less than the final tally. For the most part, the industries responsible for the latest job gains were those that had boosted growth for much of the past year: healthcare, manufacturing, retail, construction and professional services. Construction led the pack among these in terms of positions created during February, with 61,000 new roles added, while retail trade saw 50,000 new jobs join its payrolls – a figure identical to that seen in the field of professional and business services during the same period. Manufacturing, for its part, added 31,000 jobs, and healthcare came in with 19,000 new roles for February 2018, a figure less than that of previous months but still indicative of that sector’s overall strength as a job creator. In sentiments that haven’t changed over the past several months, Bloomberg reported that economists and business leaders expect the Federal Reserve to implement the first of at least three increases to federal benchmark interest rates during its meeting that begins March 20. Finally, The New York Times noted that the strength of February’s job gains could put a damper on the White House’s plans to implement a variety of restrictions on foreign trade, most recently tariffs on steel and aluminum. Construction and manufacturing, both of which contributed significantly to the month’s expanded job growth, depend on both of those materials to considerable degrees, sometimes in specialized varieties that are not available in the U.S.